I had a request for a simple baby shower cake... one bootie blue, one bootie pink, because the gender was a surprise. 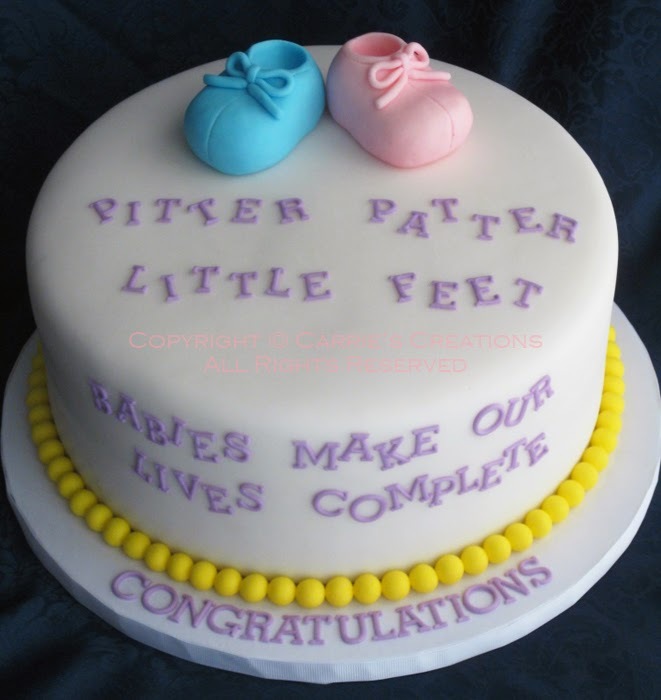 This chocolate cake with chocolate Swiss meringue buttercream was covered in fondant and the cute phrase: "Pitter patter little feet, babies make our lives complete... Congratulations." Congrats on the wee one's future arrival! 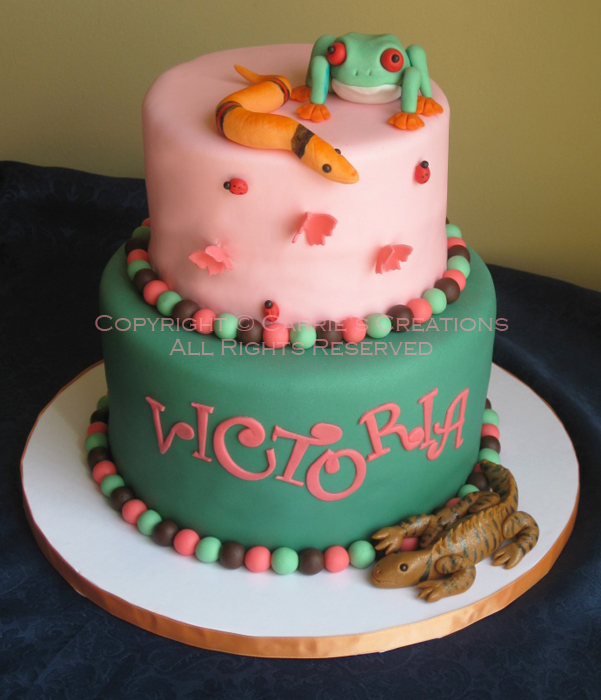 I had less than a week to make a reptile-themed cake for a 6-year-old girl. Yes, that's right, a GIRL! I took the order because it was for someone I know plus I thought it was doable (it was finished 12 hours before the deadline... I am a hopeless procrastinator). The party was being held at a reptile zoo (boy, was it busy for a Sunday!) and I delivered it using the worse roads ever, but the cake arrived intact. The top tier was vanilla cake and bottom tier was chocolate cake, both filled with vanilla Swiss meringue buttercream. All the decorations were fondant. I thought it would be cute to have 6 things to represent her age, since she was going to have a number 6 for her candle. My favourite item was the lizard dusted with gold. 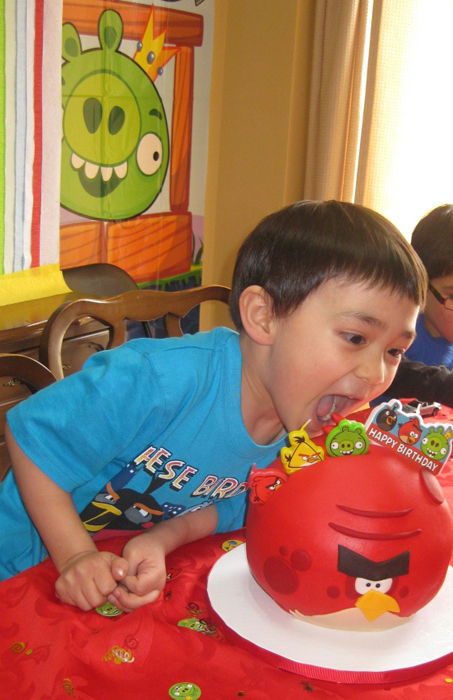 Little Joaquin turned 3, and the theme was The Three Little Pigs (obviously, lol!). 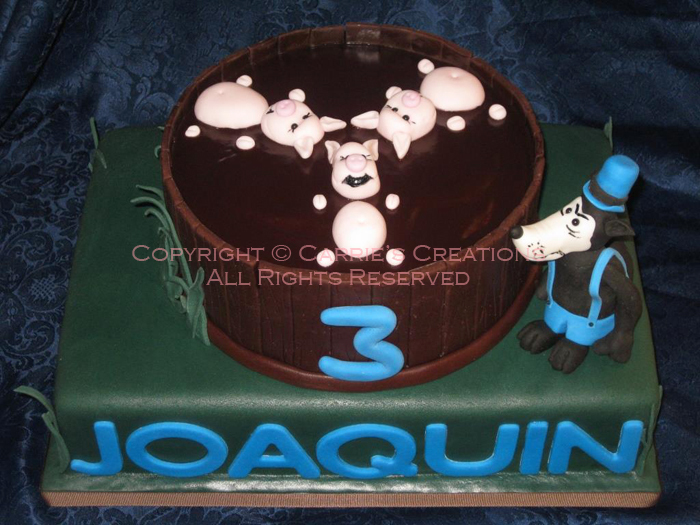 The fondant pigs were swimming atop of a chocolate ganache "mud" bucket cake. The chocolate cakes were covered in chocolate fondant "wooden planks" and green fondant. The filling was chocolate Swiss meringue buttercream (the family loves chocolate). The evil wolf was made of fondant, with the wanted-poster invite as inspiration. 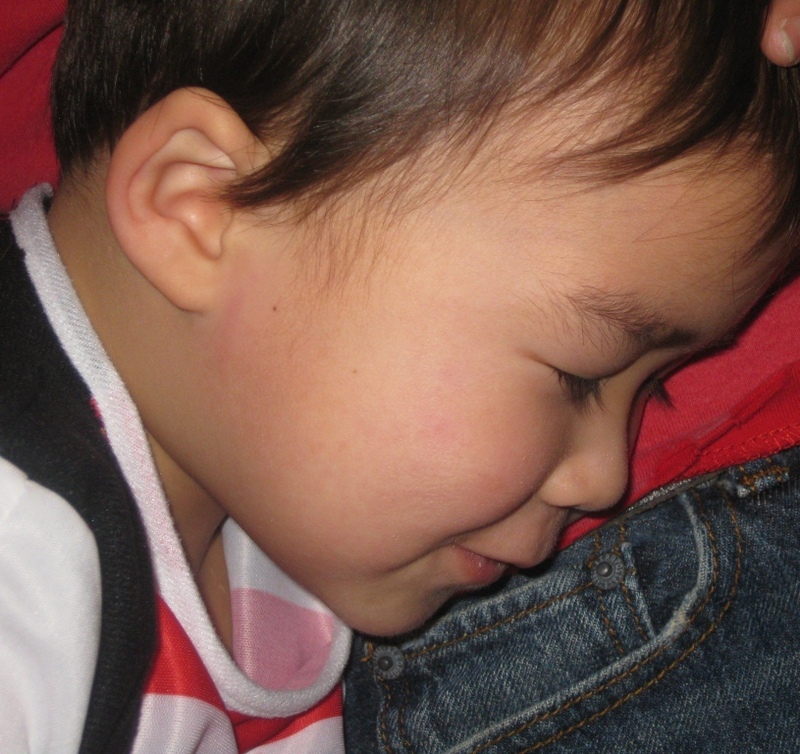 Little Joaquin savoured biting into the wolf, lol! Our friend's in-laws were both turning 60 later this year. They decided to throw them a surprise party, MONTHS before their actual birthday, lol. 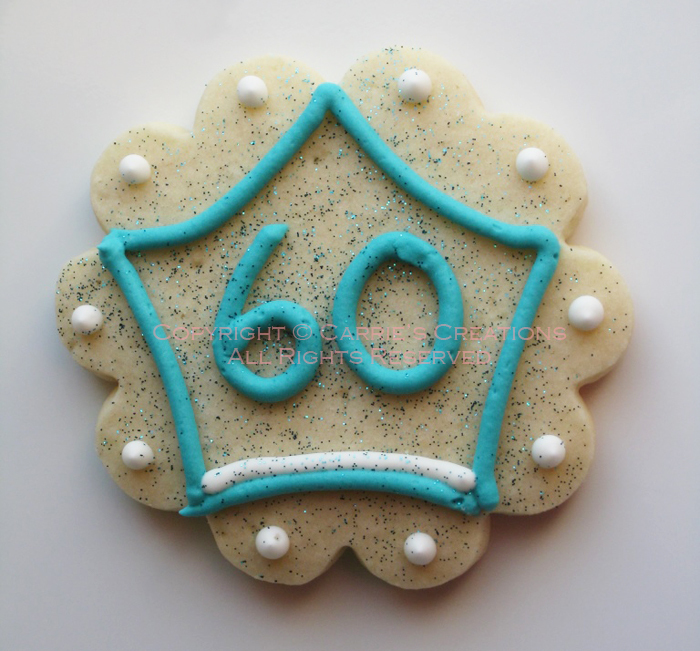 So, I made these teal/white/disco dusted sugar cookies for their favours. 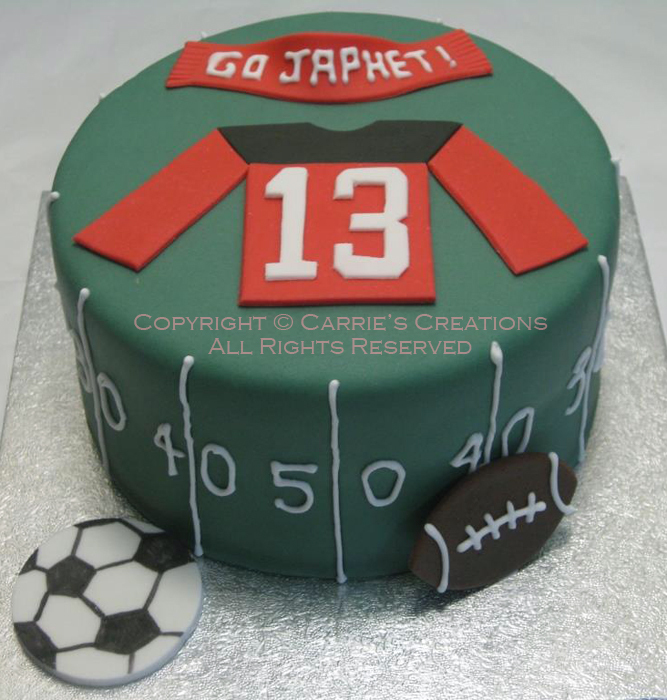 My colleague ordered this cake for Japhet, who turned 13 this year. He plays football and soccer, so the theme was sports-related. One layer was chocolate, the other was vanilla, and the filling was chocolate ganache. July, Where Did You Go?! 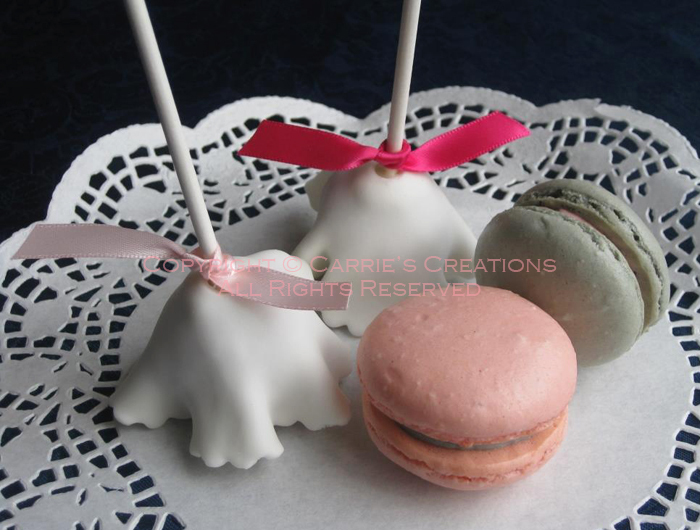 I was requested to make some sweets for a wedding... and the bride-to-be wanted macarons and cake pops... in ivory, grey and pink colours. 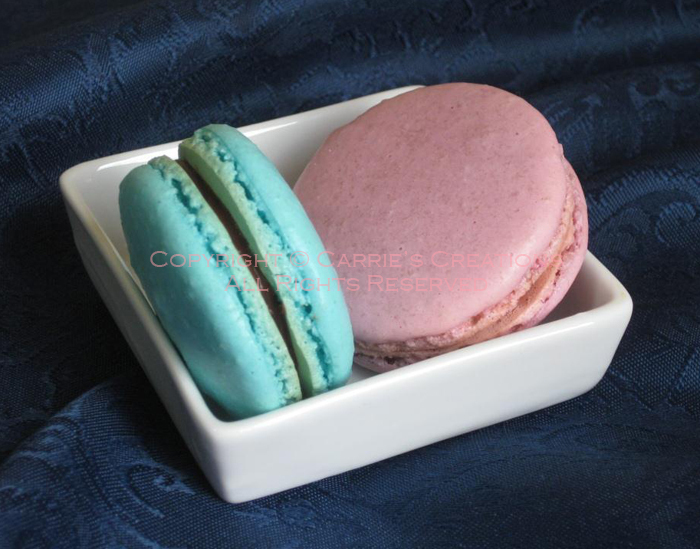 The macaron Swiss meringue fillings were filled with opposite-coloured shells. My co-worker was leaving for school in the States (to become a lawyer)! 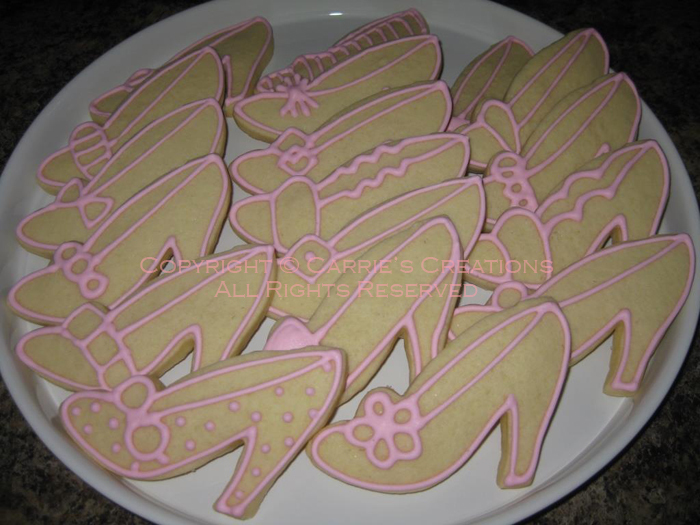 She's such a fashionista, I made her shoe-shaped sugar cookies with pink outlines in different designs. 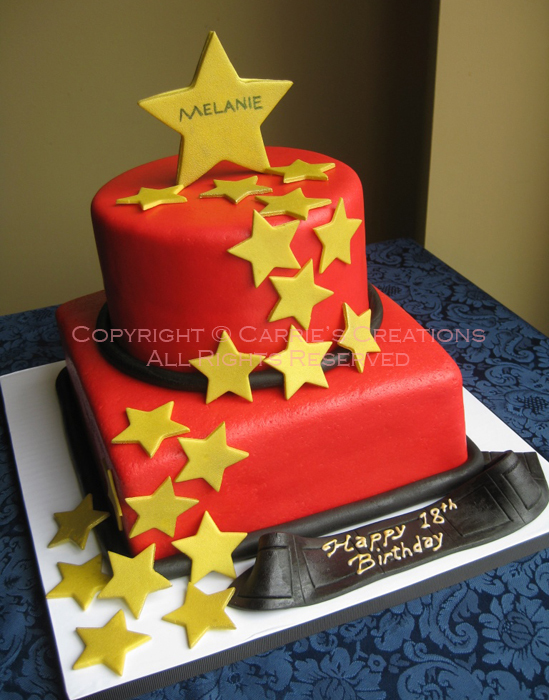 An 18-year-old requested a glamorous cake for her birthday for her Hollywood themed birthday party. The stars had to be gold and the other colours had to be red and black. The red marshmallow fondant was flavoured with black cherry Jell-O. The top tier was vanilla cake with vanilla Swiss meringue buttercream while the bottom tier was chocolate cake with chocolate ganache flavoured Swiss meringue buttercream. The vanilla cake was paired with vanilla Swiss meringue buttercream, topped with fondant and fondant decorations. Lots of gold accents here: the numbers, letters and stars and wire were coloured with a gold spray; the pearls were gold lustre-dusted. Earlier in the morning to early afternoon, the weather was horrible... one of the worst conditions you can get for fondant: RAIN. Luckily, it let up by delivery time, but we still had to combat fondant's Nemesis #1: Humidity. Good thing I put toothpicks to help keep the numbers upright for the 40-minute (very) bumpy ride because it arrived intact. I hope the birthday lady enjoyed her surprise cake! Did someone say "French Macarons?" These almond treats are surprisingly simple to create, you just need a bit of time to wait and the right piping consistency. I tried a few recipes, but I think I will stick with the no-aging-egg-white method. I added the colouring as the last step so I didn't have to make so many batches. I filled it with hazelnut chocolate spread, but could have easily used buttercream or ganache. YUM! My son's school had their fun fair and I wanted to do something different... so I decided to donate two dozen sugar cookies in a basket. I figured, people were more likely to bid on an item they could see in person. I hope the highest bidder enjoyed it! 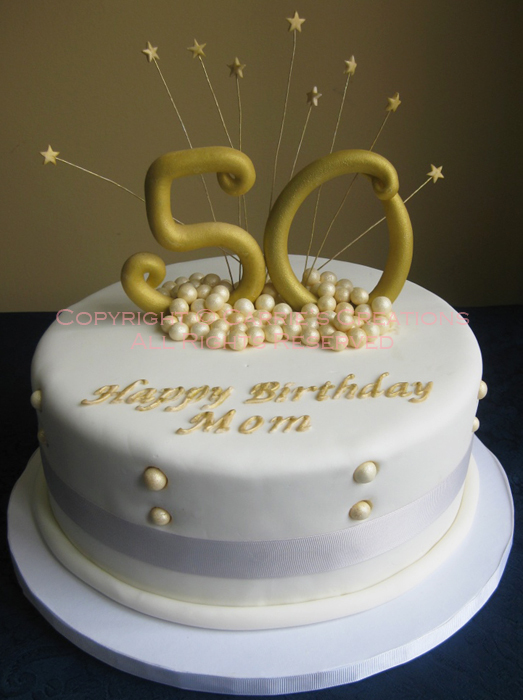 A long time ago, my aunt-in-law (who loves to bake) requested that I make this cake for her birthday. I had no clue what this was, so I Googled it. Lots of images popped up, but I chose a recipe from Food Network Canada's website since it looked the least intimidating. Her birthday was last week, and I fulfilled her request. If I added up all the hours I spent on this cake, I would guess 3 to 4 hours in total, which was during a 2-day span (the recipe didn't give any indication of how long it would take... probably because it would scare people from trying it). Originally, William wanted a Corvette cake based on one of his Hot Wheels cars. Then, he was exposed to Angry Birds. And he changed his mind. 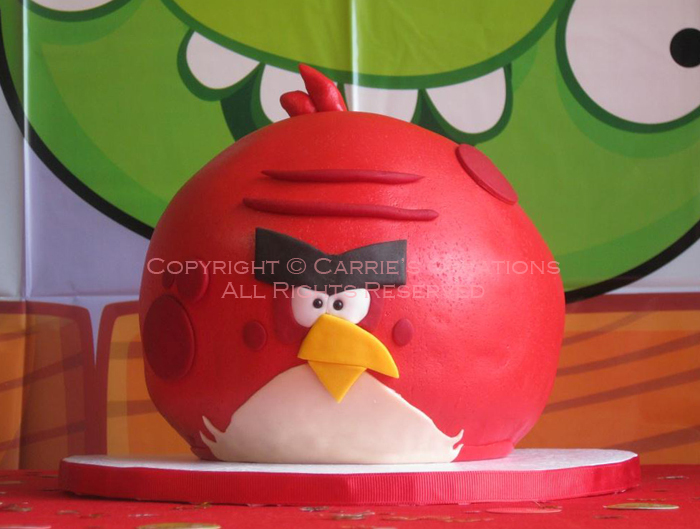 But, instead of the regular red Angry Bird, he wanted the big fat red Angry Bird. We questioned him on his decision, but he was certain that was the cake for him. I must say I'm not a fan of ball/dome pans, because of the increased (uneven) baking times and its crustier outer part that touches the pan. But I had to use it for this spherical cake. My solution - carve out the majority of it. This pan set had a inset pan, so I think because the portions are different and one was in another, my normally 50-minute baking time for the recipe took an extra 30 minutes. So, yes, the cakes were overbaked, but it still tasted OK. It was vanilla cake with vanilla Swiss meringue buttercream mixed with strawberry and milk chocolate crispearls. Dark chocolate ganache coated the cake before topping with the strawberry-flavoured red marshmallow fondant I made (haven't done so in a while). I bought wall decorations and balloons to match the theme. 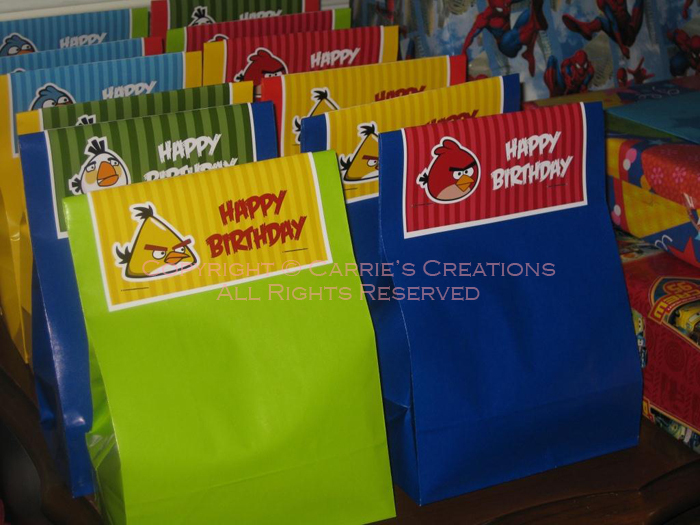 The bunting was from a free printable template, and I customized the text. The crepe streamers took the longest time to put together yet it was a great way to cover up my dining hutch. Time got the best of me, so we ended up with three activities. We played "Knock the Piggies Down." 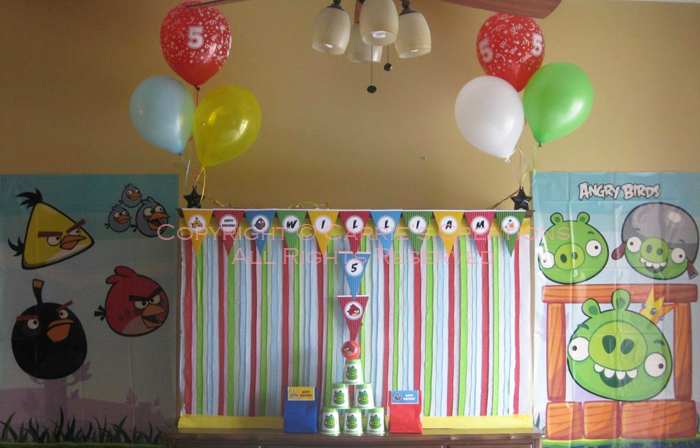 Plastic green cups had the green pigs taped on and stacked like a pyramid and the red Angry Bird was taped on a red ball. The kids played this game for a while. Such a simple concept yet it worked. 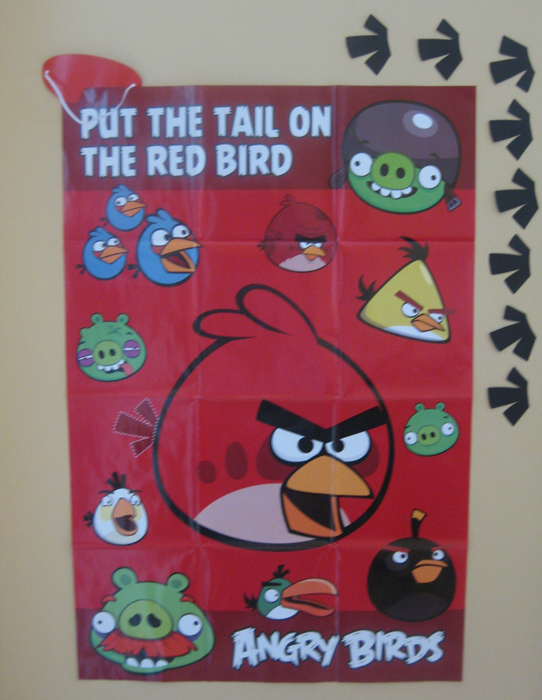 Next game was "Put the Tail on the Red Bird," and I had my friend Solmaz cut out the tails from black cardstock because the ones that came with the game were stickers, which was too permanent for me. I put double-sided reusable tape on each one for ease of use. The game resulted in some kids walking into the wall, but they still enjoyed themselves. The last activity was a cookie decorating station. 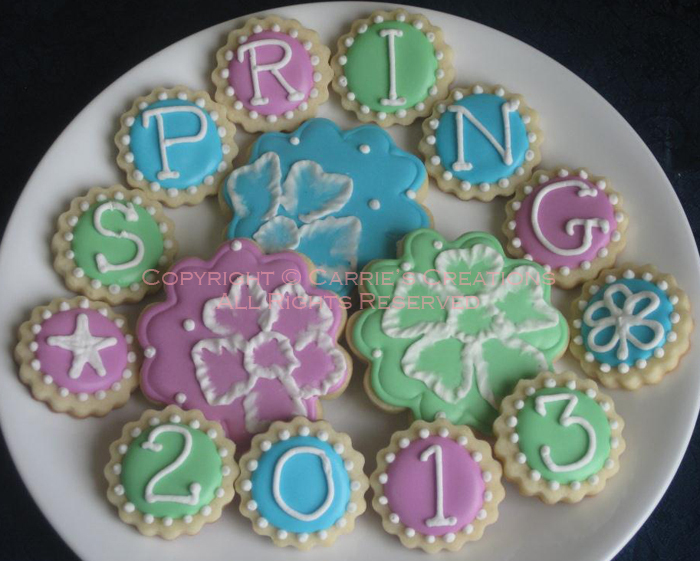 I made two dozen sugar cookies and coloured the royal icing. Of course, I was expecting a mess! 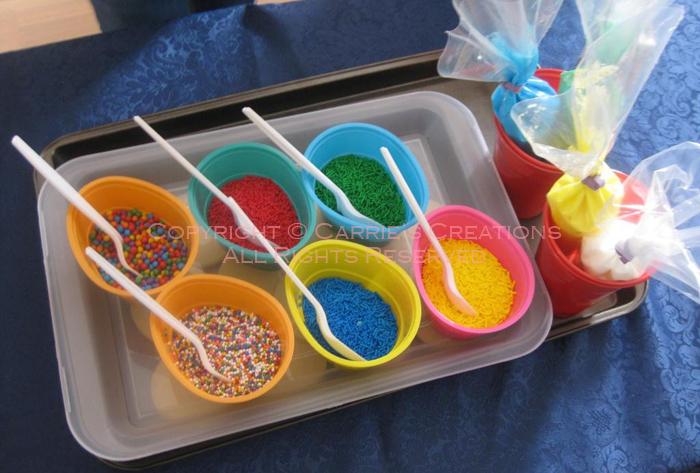 At least the sprinkles were jimmies and bigger kinds, rather than coloured sanding sugar. The kids did love creating their own cookies. I have a co-worker that really loves my cookies, whether it be gingerbread or sugar. This time, she wanted sugar cookies in egg shapes. Unfortunately for me, I do not have an egg cutter besides a really big one. So, I took a normal circle cutter and bent it into an egg shape. I mourned the loss of the original roundness but I didn't want to waste time to buy another cutter. 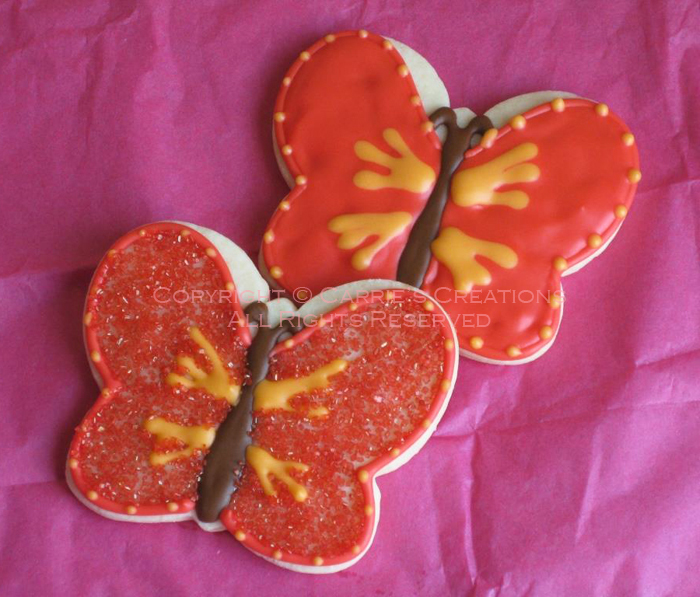 Then, it was just a matter to piping some royal icing as outlines or whatnot. To get the sprinkles to stay on the cookie, I applied a thin layer of corn syrup, and waited for it to dry. I remember making cookies for Riley when he turned 1... now he's 3! Where did the years go?! 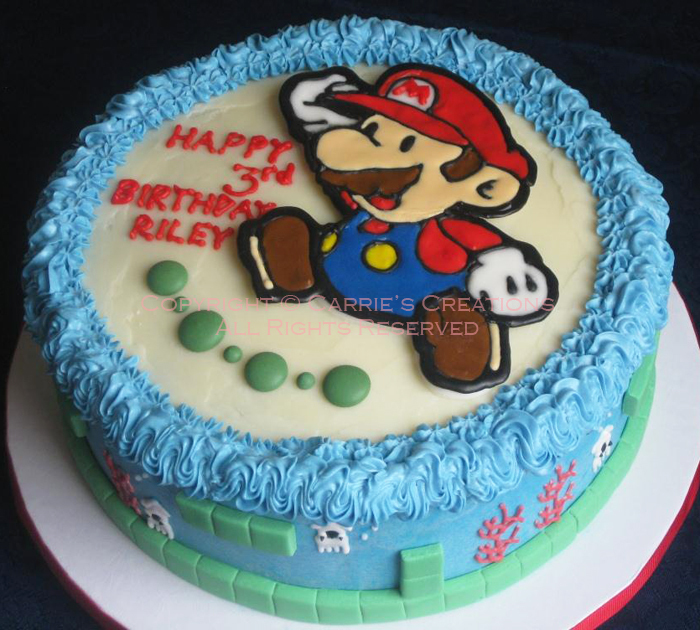 He's really into Super Mario anything, so it was also his cake of choice. His mom told me that the kids do not like fondant at all (bad experiences). Instead, the chocolate cake had vanilla Swiss meringue buttercream filling and sides, and white chocolate ganache on the top. 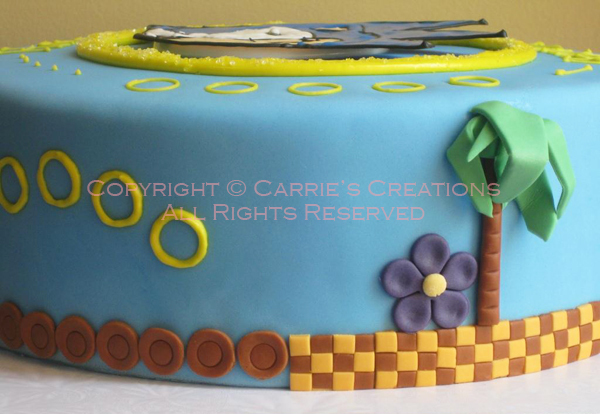 Mario was actually a royal icing transfer, as were the dots, squids and coral. The green blocks had to be made of fondant but they can be easily removed prior to eating. Originally, Kaiden wanted a Wolverine cake. 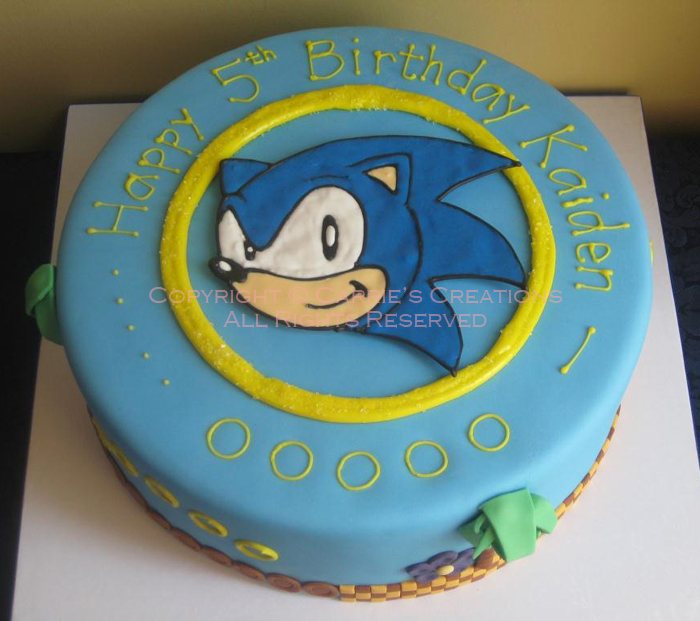 Then I was told he had changed his mind and wanted a Sonic cake instead. The design is loosely based on what my friend had submitted. I decided to make a royal icing transfer of Sonic's head in a ring. The cake was vanilla with vanilla Swiss meringue buttercream. The whole thing was covered in blue fondant, and fondant and royal icing details. I am super proud of the yellow and brown checks... those took the longest to make! 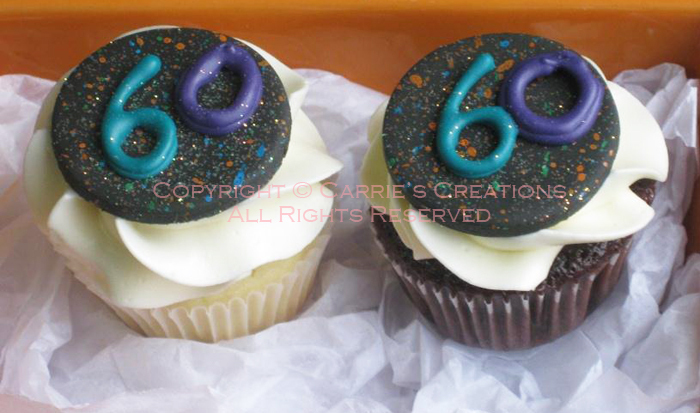 These chocolate and vanilla mini cupcakes with vanilla Swiss meringue buttercream were for a 60-year-old. The topper design was based on the actual decorations they had for the party. 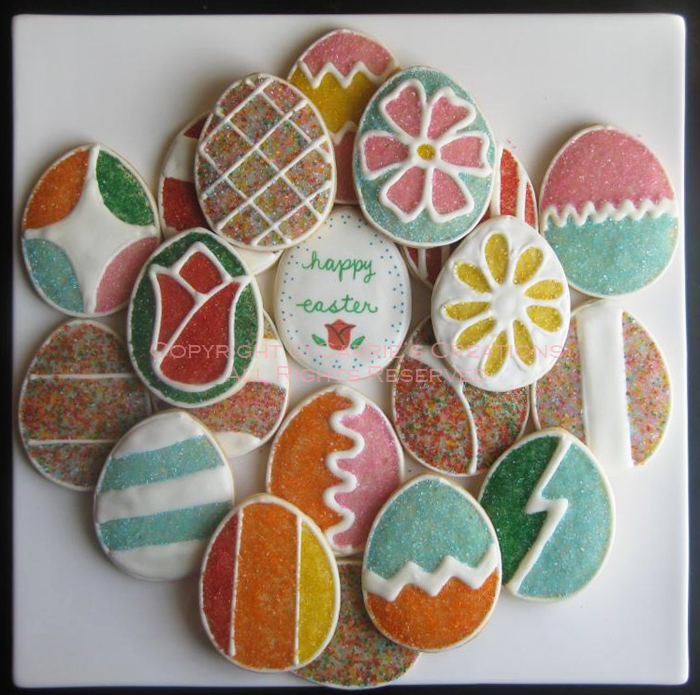 The black fondant circles were splattered with orange, blue and green colours. Then, I piped teal and purple royal icing on top. For the final touch, I sprinkled disco dust all over them. She's here... Baby Amy... 4.5 weeks early!!! No, she is not the daughter I've always wanted ("Amy" was also the name we had chosen if we had a girl), but a couple of good friends'. I can't envision having baby #3 right now, but my husband seems to think I'll change my tune once I reach 35 and both boys would be in school. We shall see. 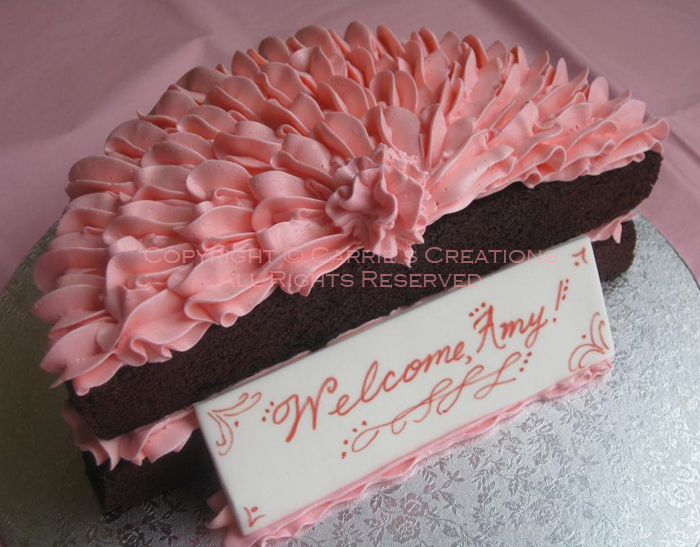 To celebrate Amy's arrival, I made this cake for our friends... chocolate cake with pink Swiss meringue buttercream. 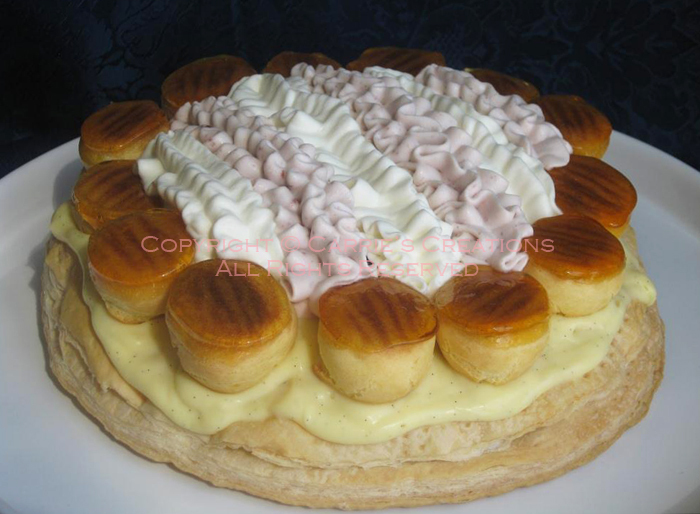 I thought I'd try the "naked" look with shell-like piping. It looked really girly, I must say. 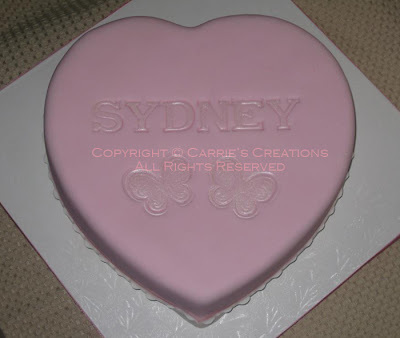 There was a lot of e-mailing back and forth regarding a dedication cake for baby Sydney. Eventually, we settled on a design that mashed together several images found online. The chocolate cake was gluten-free, covered in dark chocolate ganache, then pink fondant. The cake was flourless, but contained a lot of chocolate, making it super rich. All the decorations were made with a fondant/gumpaste mix. Sydney's mom was so impressed with the finished product, she requested to have a secondary fruitcake decorated. I kept it simple, as I had a short time to complete it. 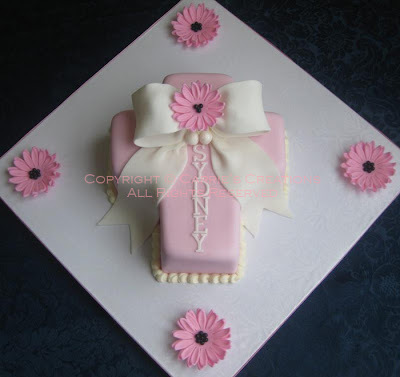 The embossing was highlighted with pearl lustre dust and the I wrapped a frilled fondant ribbon around the base of the cake. Cute little Mason turned 2! 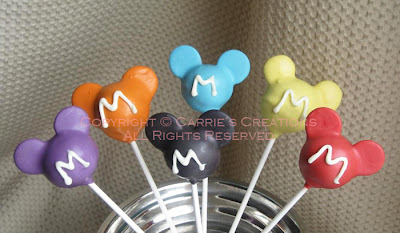 He is a fan of Mickey, hence a Mickey-themed party happened. I made chocolate cake pops (chocolate cake + vanilla Swiss meringue buttercream + dipped in dark Belgian chocolate + dipped in coloured moulding wafers). These favours took me FOREVER to complete... the orange and yellow chocolate decided to not have the proper viscosity (not thin enough), so I only managed one cake pop for those colours. I have great respect for all the cake artists that use the chocolate medium, because I had such a tough time and can't imagine it being my choice of decorating. I am so happy the guests loved it (they were eyeing it when it first showed up). 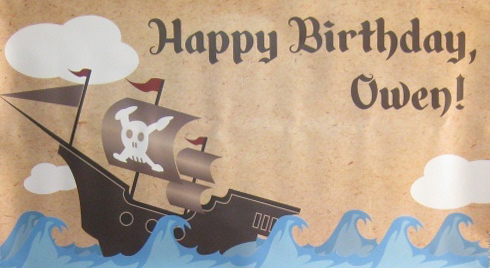 I made a banner via Vistaprint, that had a pirate ship (it was a template design). I had little "booty's" for favours that included candy, chocolate gold coins, a map, an eyepatch, a bandana, pirate tattoo and stickers. Luckily, I had booked the Friday off work, which was when the horrendous storm hit... I spent a lot of my party prep time shovelling snow! The change in plans made me cut a lot things out, just because I didn't have the time (ie. helium balloons were out of the question with unplowed snow on the roads; no cake cannon-pops; no railing for the ship). 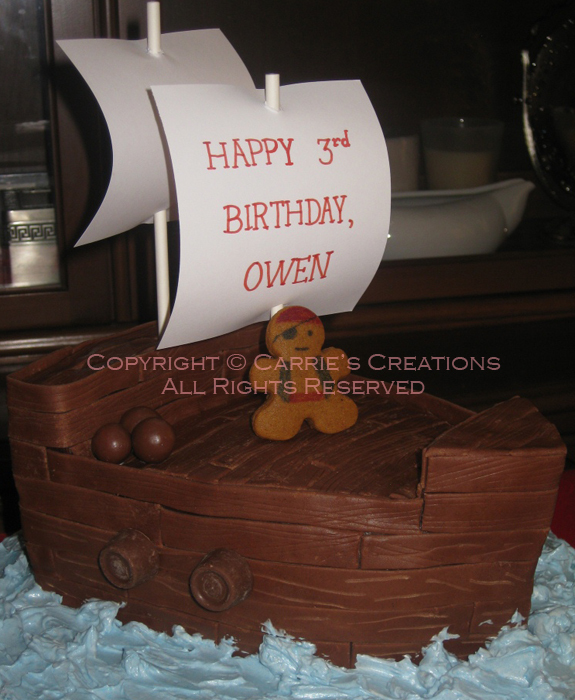 The pirate ship cake was a down-to-the-wire effort, finished at 2am on Saturday morning (the party was set at 10am). I enlisted help from friends, because I needed it. They helped me with some food prep and putting up streamers. Thanks, Ya & Matt! There were only 2 activities... only because a) I was running out of time, and b) the attention span of little kids is extremely short. We played "X" Marks the Spot. 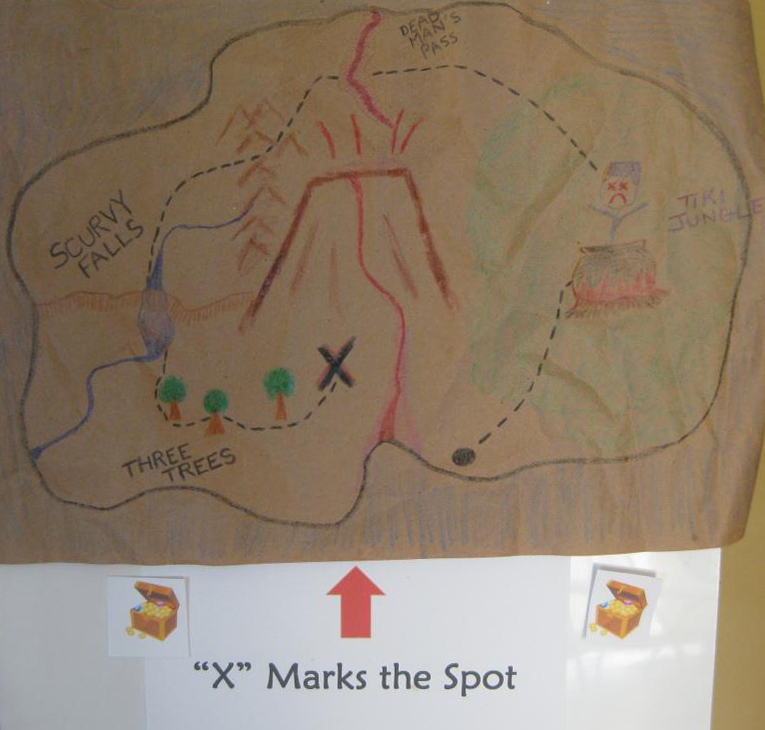 The map was hand drawn by James and the challenge was to put the treasure chest on the X... blindfolded. In truth, I don't think anyone won. 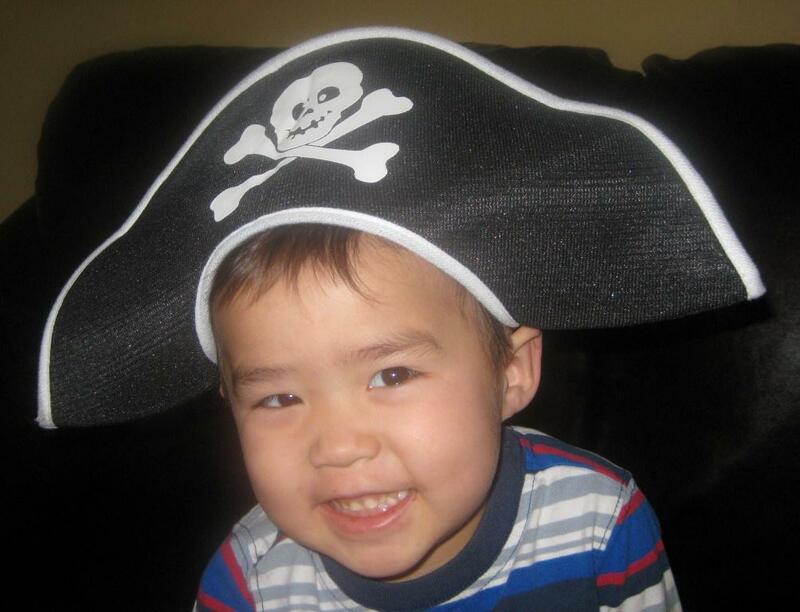 At one point, Owen had a bloody nose from bumping into another kid... how fitting for a pirate. He didn't like us trying to stem the flow, though. Let's get back to the cake... chocolate with strawberry Swiss meringue buttercream and strawberry crispearls. I carved it, then ganached it, then applied strips of chocolate fondant planks to the sides and top. Easy, but a bit time-consuming. My chocolate cake is not ideal for carving, but for little projects, it's OK. So, I had to add supports to keep the ends together. I added inedible masts and a little pirate gingerbread man, or "BBs" as Owen calls them (see, I didn't even have time to make royal icing). Final touches: cannonballs (Whoppers), cannons (Rolos) and a turbulent sea (blue buttercream). This little 9" cake was carved down, and it was enough for the guests (only maybe 6 servings left over). Let Them Eat... More Doll Cake! This past Saturday, we celebrated the birthdaysO of 4-year-old twin girls with a pajamarama party! 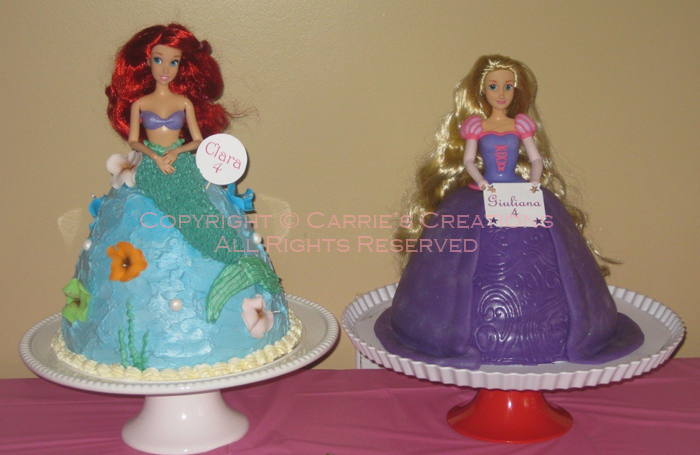 Obviously, they like princesses, so their mom asked for Rapunzel and Ariel doll cakes (and she provided the dolls and design in mind). The Ariel cake was chocolate cake with strawberry Swiss meringue buttercream and strawberry crispearls. 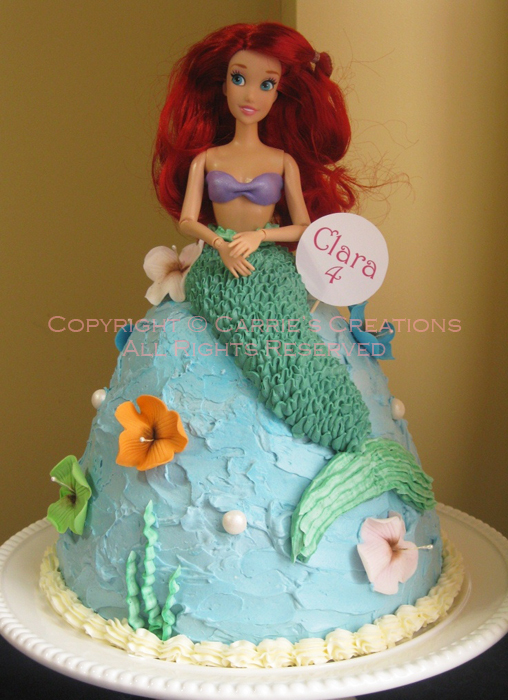 The "ocean" was the same buttercream tinted blue and had a few seaweeds, flowers, and pearls throughout. 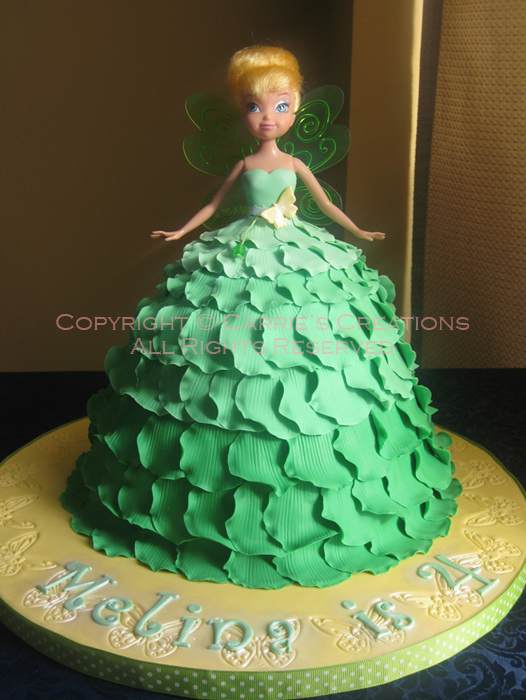 The fin and scales were piped with green buttercream. 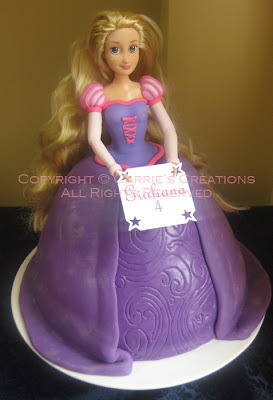 The Rapunzel cake was chocolate cake with chocolate Swiss meringue buttercream and milk chocolate crispearls. Under the fondant dress was dark chocolate ganache. It was a triple chocolate combo! Transporting the cakes was fun... I had to actually hold the Ariel cake, since it was stuck on the cake stand. Rapunzel sat in a box, so no worries there. Good thing our friend didn't live that far. The only thing I didn't really like about the doll cake pan (I've only used it once before) was the baking time. My chocolate cake is pretty moist, so I was afraid of burning it by leaving it in the oven longer than the recommended time of the pan's manual. Having said that, the concern was whether the cake would slide easily out of the pan without leaving any cake stuck to the sides. Happy 4th Birthday, Clara & Giuliana! I'm going to be discussing the cake I made for this past Saturday. 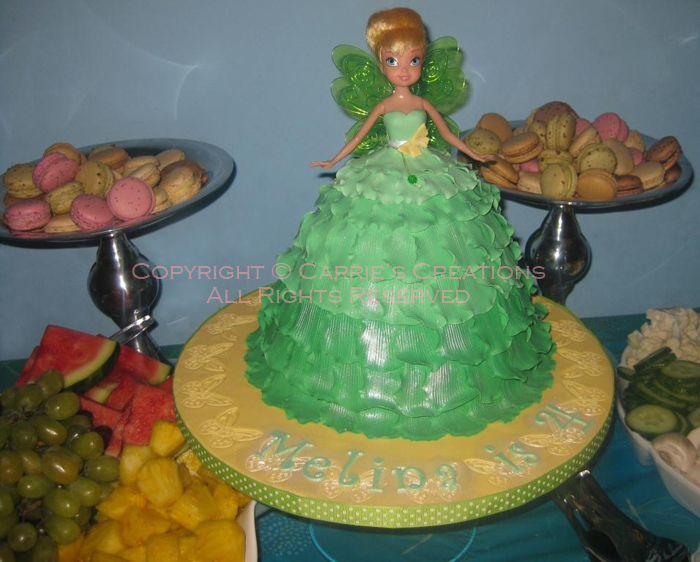 A Tinkerbell doll cake for dear Solmaz's daughter's 4th birthday. Her birthday was in December, but the party was postponed. I finally purchased a dome pan for doll cakes. Yes, no more stacking layers then carving them down! :) It will help cut down the cake prepping part, especially when I have two more doll cakes for this coming weekend! Solmaz showed me a design from Kat's Cakes, and this is my take. I made the fondant petals more distinct in hue (light to dark, from top to bottom). The petals, I've added lustre dust for that little sparkle that fairies have. Of course, frilling took the majority of my time for this cake! I added a ribbon sash which was meant to conceal a gap from a pull-string that chimed and made the wings light up. I like the simple butterfly at Tink's waist. The cake board was yellow fondant, embossed with butterflies; also it was my first time using corn syrup as an adhesive to the board (instead of piping gel). It seemed to get the work done, so I guess anything sticky would suffice. 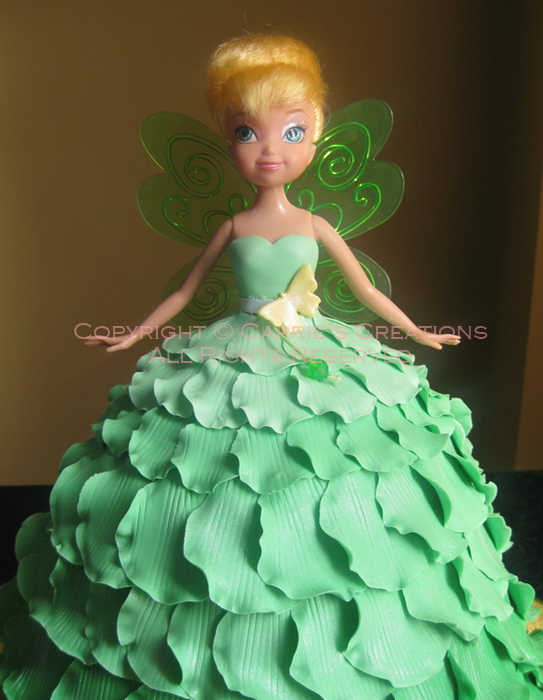 The cake was chocolate, which I cut in two and added a third base layer (it didn't seem like a lot of cake since Tink was a shorter doll than the standard). The filling was strawberry Swiss meringue buttercream with Callebaut strawberry crispearls (yummy chocolate-coated puffed rice cereal). Here's the pic of the cake in the venue... with Solmaz's scrumptious macarons in the background (something I haven't attempted yet, but I plan to... eventually).